With the advent of modern technology, it has perhaps become a necessity to keep yourself up to date. Be it an old computer, or a barely 2 year old smartphone, technology becomes outdated fast. Who would have thought that such would be the case with modern cars too? Yes, we aren’t talking about transmission, or engine, or fuel, we are talking about those headlights which light your path tirelessly. According to a report, about 20% of cars by the year 2020, will have LED headlights. But, we aren’t here to talk about the future. Below, we’ll explain why the time and the technology are both right, to change your halogen headlamps to LED headlights for cars. But what is an LED? Simply put, LED stands for light emitting diode. While your halogen headlight works by burning a single filament of a high resistance metal at a very high temperature, LEDs, on the other hand, produce light when a high voltage current passes through them. You may have considered switching to an LED at some point in time, perhaps you were put off by its high cost. But rest assured, we’ll explain to you some of the most obvious benefits of using LEDs which only illustrates how important it is, to get one. What do LEDs offer that Halogen doesn’t? Brace yourself for an absolute shocker. Did you know that halogen only converts about 10% of the available energy to visible light? Talk about wastage, right? Most of the energy is consumed by a halogen filament to produce infrared and ultraviolet waves. This escapes as heat. LED on the other hand, converts almost all of the energy to visible light. The white light produced by LED is by a process of electroluminescence. This guarantees no heat loss, and looks almost like daylight. On average, an LED bulb should outlast a halogen by about 15 times! That is 15 reasons why LED is better than halogen right there. Of course, we understand that the cost of initial procurement of an LED is high, but it definitely pays off in the long run. If you have ever seen a traditional halogen lamp of your car, you must have seen a silver reflector plate. And it does exactly as it sounds. The light from halogen is dispersed in many directions. Therefore, a reflector plate is essential for focussing. In LEDs, the light produced is unidirectional from the source itself. It almost never requires a reflector plate. This ensures highly focussed beams which offer more penetration in fog, and offer better visibility in general conditions. Halogens produces warm, yellowish light in a temperature spectrum of 2000 to 3000 kelvin. Not only is the light more warm, but it appears yellowish and offers reduced visibility in fog like conditions. LEDs, meanwhile, produce white light. The temperature range of 5500-6000 kelvin ensures optimum visibility even in the most demanding of situations. Halogen lights cannot be dimmed as per requirement. You can either operate it at full power, or choose the next lowest setting, or you can turn it off. This is because halogens are made of a single filament. LEDs tackle this problem by being numerous in a single headlight. If you observe closely, you can spot hundreds of small LED units inside an LED headlight. This gives you the power to dim the light as per requirement by turning off a number of LEDs when required. When the current is passed through a halogen, it takes a couple of seconds to heat up and offer maximum illumination. LEDs on the other hand, are almost instantaneous in nature. It takes almost no time in reaching maximum output from the time it’s turned on. Studies have shown that using LED improves reaction time by as much as 30%. That is more than enough difference between life and death. Halogen bulbs can be notorious during cold weather conditions. They may have trouble offering decent illumination during operation. LEDs know no such limitation. Be it a blizzard, or a beautiful snowfall, LEDs always work. With LEDs, you don’t need to worry about light output dropping off eventually. Because their light is independent of the heat produced in the filament, it never goes off to sleep. If everything is up and running like clockwork, LEDs will shine constantly. Because LEDs work as unit of hundreds if not more, it is easy to put them in various shapes and designs. 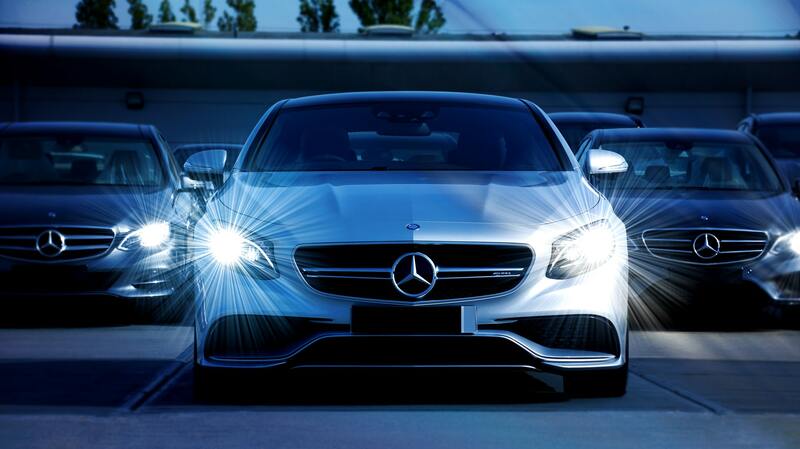 This is why you often see modern luxury cars, the headlights of which, look something like a transformer from movies. Halogen cannot be put to use in various shapes and designs since it is a single filament. One can only change the design of the lamp in which a halogen is placed. Using LEDs thus offers to change, or even increase the visual appeal of your car’s headlight. Admit it, LED equipped headlights just look better, don’t they? These were just some of the benefits of using LED in your car’s headlights. There are plenty of other advantages that cannot possibly be summarized here. But, if you found this guide helpful, do leave a comment below.